Enjoy our Sequim Real Estate Newsletters and market reports. There are actually several newsletters for buyers and sellers, depending your your needs and preferences. Below are your options. No cost, no obligation. Just good information. You can always view the most recent market video from the Sequim Real Estate Blog. The video is embedded in the right column half way down the page and updated every month. 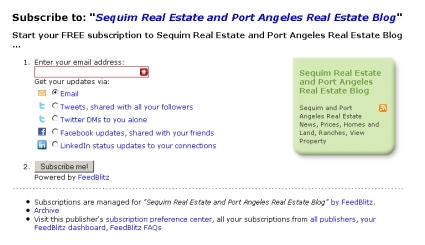 You can receive Sequim Real Estate News via email once a week by simply subscribing here. Once a week you will receive an email with the past week’s list of articles from Sequim’s largest real estate blog with over 1,400 articles. When you receive your newsletter in your email, you will see the full titles and if any of the articles look interesting, you just click on the title and Voila! you’re reading the article. Subscribe to the Sequim Real Estate Newsletter via Email now. Chuck writes a special newsletter which is distributed via email only to his current buyer clients. If you are a client, you will be receiving that newsletter. Chuck writes a special newsletter which is distributed via email only to his current seller clients. If you are a client, you will be receiving that newsletter.